*Many thanks to Gravitas Ventures for the screening copy. 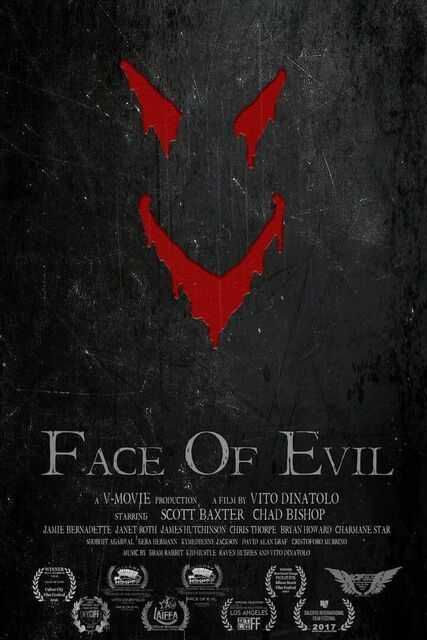 From director Vito Dinatolo, starring Jamie Bernadette, Scott Baxter, Chad Bishop and Janet Roth star in Face Of Evil. What can be said about this film, apart from confusion, from what I did gather it was about the trauma of war and the demons we carry home because of our sins. The film starts with a returning serving solider Jay Williams ( Scott Baxter) who has done his time in the army, he returns on the fourth of july to celebrate in his home town with his sister and his former friends, a standard party starts with the usual drug taking and copious amounts of alcohol drunk. Then when an ex girlfriend turns up, gets drunk dies and returns as some demonic beast, things start getting really silly from this point. Only 30 minutes in I'm already thinking of turning it off, why? well I thought it was another standard demonic/ walking dead type horror, then it completely changes and for the better. We see various flashbacks of scenes that can only be described as Afghanistan or Iraq, we see a little girl in the desert all smiles, we see the soldier approach her, this scene is very important as it forms the basis of this whole movie, about the things we do, whether in battle or in life in general, which will always haunt us, or the demons we carry afterwards. What we have left is a very clever take on PTSD which is common in most serving soldiers after serving tours in war torn countries, is the soldier really seeing demons are is it in his mind due to the trauma of battle, although this film could have been better, including the first thirty minutes of silliness, it does turn into a decent film about the trauma of war, and the demons on our conscience we have to deal with afterwards. Not a fantastic film by any means but still an enjoyable low budget film, that has been directed and written very well by new director Vito Dinatolo.